Flap discs are used in heavy stock removal, often weld removal. They outperform Resin Fiber Discs due to their increased lifetime and last twice as long as Aluminum Oxide discs. To achieve a finish equivalent to a Resin Fiber Disc, always use a flap disc one grit coarser. e.g. If the operator is running a 60 grit Resin Fiber Disc, try a 40 grit flap disc. This 40 grit flap disc is made with Zirconia Alumina grain, which is ideal for stainless steel and metal applications while still working well with non-ferrous applications. The Type 29 angled face allows for 90% of the abrasive material to be in contact with work surface, yielding maximal grinding surface area for greater ease, effectiveness and speed. We use a high quality backing plate to help absorb vibration. Specific suited applications include: weld blending, removing weld slag, deburring, edge blending, surface conditioning and general metal fabrication. 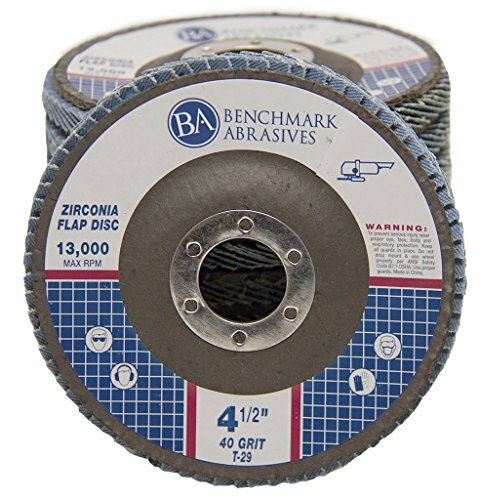 Benchmark Abrasives uses only the highest quality grains and backing material for our flap discs. Designed for grinding, blending and finishing on a wide range of metal. The #1 choice for welders and metal fabricators. Made in accordance with ANSI safety requirements. For use on an Angle Grinder. If you have any questions about this product by Benchmark Abrasives, contact us by completing and submitting the form below. If you are looking for a specif part number, please include it with your message.